Located on the same ridge as Mount Snow, Haystack is a mid-sized ski area that has struggled to find a place in the competitive Southern Vermont ski market. After attempts at an upscale independent ski area and a satellite ski area, Haystack is now being developed as a private club. Word of a potential new ski area on 3,445 foot Haystack Mountain spread in early 1964, when the Haystack Corporation applied for a use permit with the United States Forest Service. Two permits were issued on July 27, 1964, including a 30 year agreement on a 10 acre plot and an annual agreement on 307 acres. Using a slogan of "Ski Haystack Before Everyone Else Does," the Everett Lord-Wood designed area likely debuted on Christmas of 1964, with Senator George D. Aiken and Lieutenant Governor John F. Daley present. The initial rollout included a three story lodge atop the beginner area, three T-Bars, and a double chairlift on the lower part of the main mountain, serving some 75 acres of terrain. A shuttle bus service carried folks throughout the fragmented base area. Coinciding with the construction of a new access road, Haystack expanded upward for the 1965-66 season with the installation of the Oh No double chairlift and the addition of 50 acres of terrain. While plans for a gondola and three story summit lodge were announced, they were not meant to be. 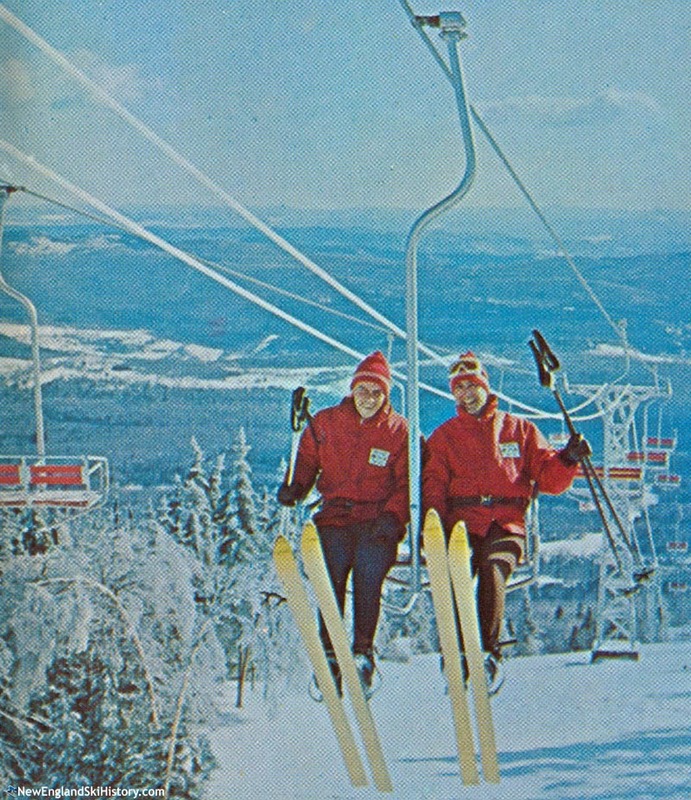 The issue of having two somewhat detached ski complexes was addressed for the 1966-67 season, when the Transfer double chairlift was constructed from the lower base lodge to the upper mountain base area. The unique lift included a road crossing with safety netting. Attention then turned to developing real estate and amenities. An early snowstorm resulted in a November opening in 1968, followed a few weeks later by the opening of a hip, new night club called "Sgt. Peppers." While Haystack was selling a hip image, behind the scenes it was financially struggling with fixing a hole. As a result, there was a change of management in 1969. Aggressive plans were made for three new chairlifts, new trails, and a 6,000 foot long gondola. Parking was to be more than doubled, while 2,200 home lots, 200 condos, a golf course, and a convention center were planned. After numerous delays, off site the 18 hole golf course and a sewage treatment plant were constructed circa 1971. Snowmaking was planned for 1973, while lifts were projected to follow in subsequent years. The optimistic plans gave way to further financial problems, magnified by the lack of snowmaking. Associated Mortgage Investors likely foreclosed on the ski area circa 1974. Snowmaking was first attempted at Haystack in early 1977, when hoses and other equipment were borrowed from the local fire department to help get the ski area open on at least some sort of frozen surface. At actual snowmaking system was installed at Haystack in either late 1977 or 1978. Haystack made regional headlines on March 12, 1977, when one of its shorter double chairlifts deroped that morning. While there were fortunately no fatalities, 11 skiers were hospitalized, some with serious injuries. Starting around 1979, the owners of Round Top likely leased Haystack for two winters. In the midst of poor natural snowfall winters, Haystack closed following the 1980-81 season. The foreclosed ski area sat idle for three winters. In January of 1984, former Stratton General Manager Don Tarinelli, Vermont State Representative Mike Kimack, and Bill Wylie formed a group to reopen Haystack. The group took control of the idle ski area in July and had it operational in time for the 1984-85 season. Big changes took place in 1985 when $2.5 million was invested in the ski area. The original Hayfever chairlift on the lower main mountain was removed, giving way to two new Poma triple chairlifts, the longer of which reached the top of the ski area. The former Hayfever chairlift was then moved to the beginner mountain for the 1986-87 season, giving novices something other than T-Bar lift service. Over a decade after it was first proposed, the The Witches area finally opened for the 1987-88 season, served by a new triple chairlift. 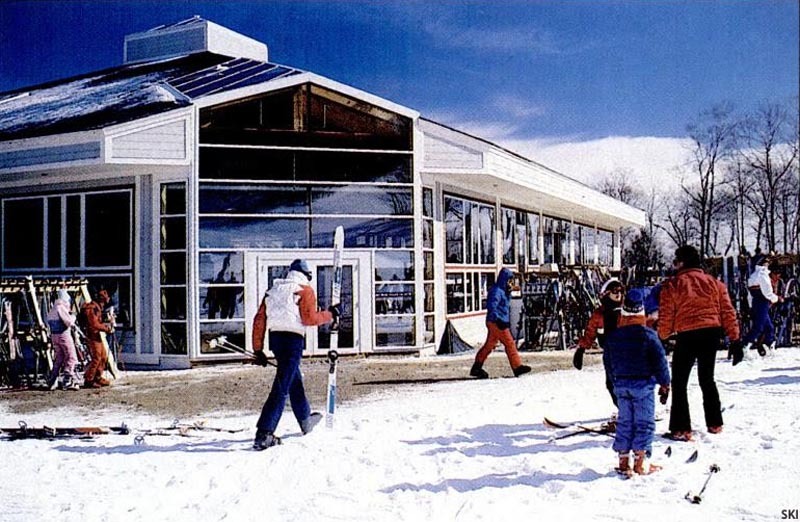 The $2 million upper base lodge was likely constructed for the following season. While it appeared to be on the upswing from an infrastructure improvement standpoint, Haystack ended up in bankruptcy by 1991. At that point, Mount Snow's parent company S-K-I Ltd. leased Haystack for three seasons and then subsequently purchased it in July of 1994 for $4.5 million. 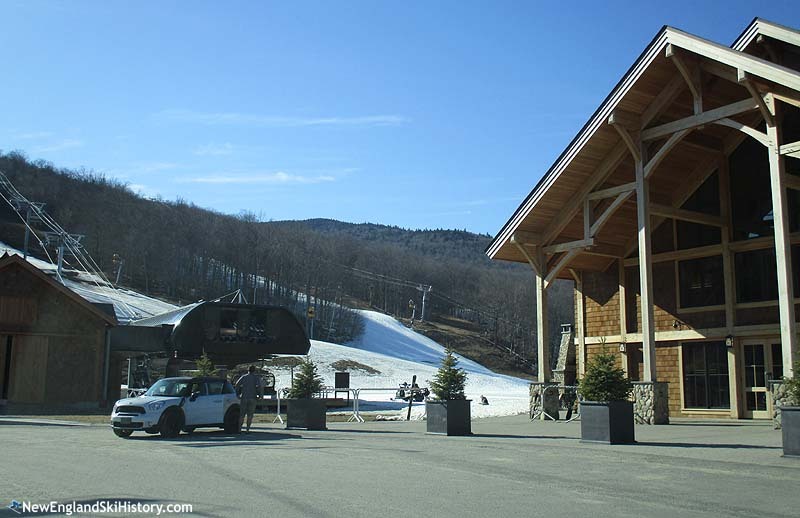 In addition to providing a nearby area for weekend and holiday overflow, the acquisition also allowed Mount Snow to pump water from Haystack's snowmaking water supply. Along with most of S-K-I Ltd.'s other areas, Haystack was rolled into the American Skiing Company in 1996. It operated less and less frequently during its time as Mt. Snow's sister mountain, eventually becoming a weekend and holidays area. In 2005, American Skiing Company sold Haystack to Tyringham Ridge, Inc. for $5 million. As part of the agreement, Haystack is prohibited from opening to the non-local general public. Up to 250 local residents per day are allowed to ski at Haystack, in addition to private club members. Following the sale, plans were put in place to develop an upscale, private ski area. Real estate sales and capitalization issues plagued the company as the project estimate soared to $450 million. The project at the idle ski area was put on hold in 2007. After being closed for 4 seasons, Haystack briefly reopened in December of 2009 with the shorter Hayfever triple chairlift. Mt. Snow then successfully sued over the use of snowmaking water per the 2005 sales agreement, therefore pushing the ski area back into closure after two days of operation. The upper base lodge was demolished in 2010, to ease current tax liabilities, as well as to open up the area for redevelopment. Haystack was sold in October of 2011 to Jim Barnes of the Hermitage Inn. The area reopened on a limited basis for the 2011-2012 season with snowmaking and one triple chairlift. Development of a connection to the inn started in 2012, resulting in the opening of a new quad chairlift on January 19, 2013. Delivery of a second quad chairlift took place in fall 2013. Named Stag's Leap, the new lift connects the lower mountain to the main mountain. A massive new 80,000 square foot main lodge opened for the 2014-15 season, providing a centerpiece for the private resort. One year later, a heated, high speed detachable six person chairlift was installed from the new lodge to the top of the ski area. "The Stack was where I learned to ski. In fact, I first started learning to ski right before Haystack closed in 1980/81, over in the lower base area on Cascade and Fanny Hill. Fun times, great memories. 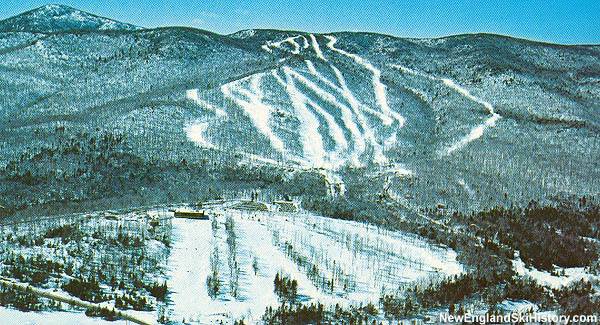 For the 1981-1984 seasons, I kept learning to ski over at Mt.Snow and Stratton. 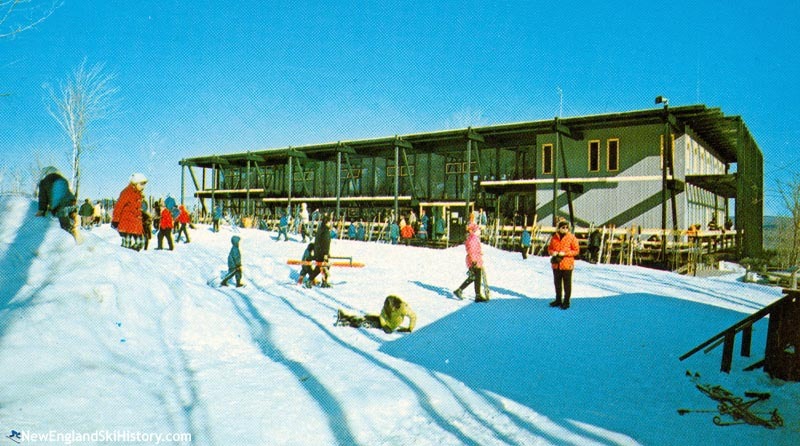 I vividly remember returning to ski at Haystack after it had been re-opened, because I first skied the upper mountain then via the transfer lift. I remember Haystack back before The Witches opened, before there was an upper base lodge, and before ANY of the new lifts were installed. I'm sad to see that Haystack isn't open to the public any longer, because it truly was a great mountain. " "I remember hiking here during the summer of 2006, whilst the ski area was in one of its defunct phases. The lower base lodge had been somewhat recently demolished. The upper base lodge was still standing, but curiously had a bunch of equipment sitting outside. The Haymaker Double was still standing, as were towers from the Transfer and Oh No Doubles. The trails were still relatively clear." "I grew up skiing at Haystack in the 60's..before the transfer lift we were shuttled by vans with the license plates 'HOOT' 'TOOT' & 'WHISTLE'. I joined my father and sister teaching in the ski school and taught Rosie Greer, many blind, deaf, and amputee skiers, as well as others from 5-90 years old. It was a wonderful place to ski and work."